Oiticica's works form a bridge between painting and sculpture; furthermore, they connect the Modernist utopia of the 1950s with the more fractured period of social and political tensions of the 1960s and '70s. His revolutionary performances, sculptures, and installations—most notably, the series Parangolé, Bilateral, Relevo Espacial (Spatial Relief), Bólide, and Penetrável (Penetrable)—outline a cohesive, sustained investigation of color and abstraction as a framework for spatial experience. The delineation of architecture in two dimensions is most visible in his drawings. From 1955 to 1956, Oiticica was associated with Grupo Frente, a group of avant-garde artists including Ivan Serpa, Lygia Clark, and Lygia Pape. Though Oiticica was still a teenager and the youngest member of the group, his Grupo Frente drawings demonstrated an intuitive response to color matched with rigorous discipline—a distinctiveness that would remain until his last works. The Sêcos (1956–57) establish Oiticica’s engagement with space as structure; in these he used color more economically, concentrating on symmetry and asymmetry. Years later, Oiticica’s Penetrables would make tangible the spatial relationships that are hinted at in the drawings. 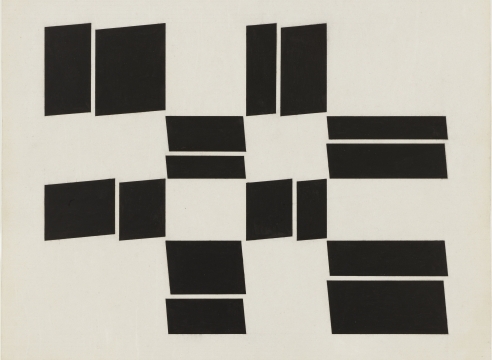 In the Metaesquemas (1957–58), with which viewers may be most familiar, he layers color in sharp precision, suspending the forms in a space that is perceived beyond the drawings’ borders. The timing of the exhibition is made poignant by a tragic event: on October 17, 2009, a fire broke out at the Projeto Hélio Oiticica in Rio de Janeiro, including the storage facility where Oiticica’s works were kept. Though initial reports of the damages were devastating, it has since been deemed that a number of works can be restored. Hélio Oiticica: Drawings, 1954–58 allows the public unique access to the visionary basis of Oiticica’s groundbreaking work. Concurrently, Oiticica's work is in group exhibitions at the Museum of Contemporary Art Antwerp; the Yerba Buena Center for the Arts, San Francisco; and Haus Konstruktiv, Zürich; and in a collection display at the Tate Modern, London. He was also featured in recent exhibitions at the Museum Boijmans Van Beuningen, the Netherlands, and the Seattle Art Museum. In 2007 and 2008, the Museum of Fine Arts, Houston and the Tate Modern presented the landmark retrospective Hélio Oiticica: The Body of Color. Oiticica's work is represented in the collections of both museums, as well as the Museum of Modern Art, New York; Museu de Arte Moderna, Rio de Janeiro; Museu d’Art Contemporani de Barcelona; Daros-Latinamerica, Zürich; and Cisneros Fontanals Art Foundation, Miami; among others. The artist's estate is managed by the Projeto Hélio Oiticica, Rio de Janeiro, and represented in the United States by Galerie Lelong, New York.